Inspiring Art Teachers to Explore Art History | Curator’s Corner: Art History Survey, A New Slant, No. 3: What Does “Middle Ages” Mean? Art History Survey, A New Slant, No. 3: What Does “Middle Ages” Mean? I’m not quite sure when the historical / art historical / cultural / religious term “Medieval” (the confluence of the Latin “medius,” middle, and “aevum,” age) came about to describe the period in the West between the fall of the western Roman empire in the 500s until the Renaissance blossoming in the 1400s in Italy. I suspect it was a Renaissance snob who thought that that long stretch of time (which, by the way, was rich in art, architecture, and culture) was “dark” compared to the brilliance of the Italian Renaissance because the Renaissance was consciously modeled on Greece and Rome. I also am curious when the term Medieval began describing a somewhat shorter, albeit lengthy, period of time in India. “Middle Ages” seems to designate a time period between two periods of great artistic and cultural achievement. In both the western and Indian cases, however, these “middle” periods were far from lackluster backwaters of art and culture. On the contrary! In India, some scholars define Medieval art as the period between the end of the Gupta period (c. 320–600 ce) and the decline of the Pallava Kingdom (c. 500–750 ce), and the advent of Islam (either with the Sultanate of Delhi in 1200, or the Mughal conquest in the 1500s). The Medieval period in Indian art is incredibly rich. When the Guptas declined in power, six thriving yet separate kingdoms ensued and flourished for hundreds of years. There was a consolidation of the Hindu kingdoms in mid- and southern India by the eighth century ce. The culture in southern India flourished through the Pallava (c. 500–750 ce) and Chola (c. 850–1310 ce) dynasties. After a half-century of battles between contending kingdoms in Southern India, the Chola dynasty (c. 900–1310) came to dominate all of southern India and the island of Sri Lanka. By the end of the Gupta period, the evolution of Buddhism in India included the inclusion of many Hindu ideas and deities. Under the Mauryan, Pallava, and Chola dynasties, Hinduism reasserted itself as a dominating faith, and was transmitted to Southeast Asia through trade. The resurgence of Hinduism is especially evident in the myriad versions of Siva Nataraja, an image that devotees of Siva carry in processions and display in household shrines. Siva is one of the major deities in Hinduism, the destroyer who oversees the destruction of the old (self and world) and controls its rebirth, or becoming (symbolized in the dwarf Apasmara on whom Siva dances). In Siva’s cosmic dance of destruction and rebirth, the fire not only does away with the physical universe but also the problems of illusion and ego-centered perceptions. In his beautifully depicted, scantily clad perfect body, elegantly posed in dance, Siva’s “ceremony” is a joyful occasion in which the worshipper experiences liberation from detrimental earthly cares. 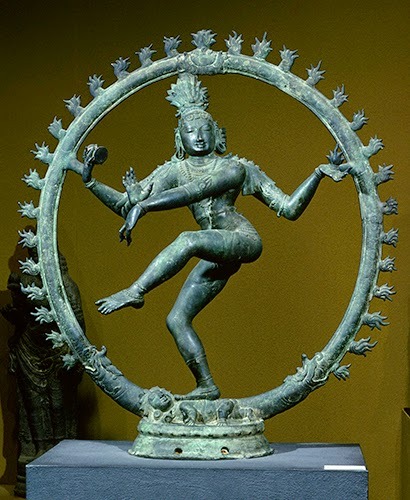 Metal casting of sculpture was known in India already in the 2000s bce. Bronze casting was developed to its highest sophistication during the Chola period. Indian artists used the lost wax method of bronze casting. A wax figure of Siva would be covered in multiple layers of clay that was then fired in a kiln, allowing the wax to melt, forming the mold for molten metal. These numerous versions of Siva Nataraja are primarily solid casts. The naturalism and elegant movement of Chola sculpture is a stark contrast to the heavy, static sculpted figures from the Gupta period, then still under the sway of Greco-Roman art. Medieval Indian architecture also flourished throughout India. 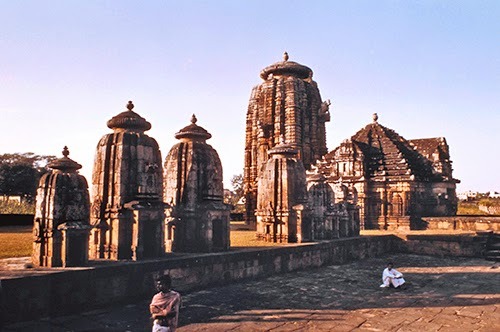 Distinguishing features are a front porch, multiple mandapas (waiting rooms for devotes topped with small towers, sometimes separate from main temple) and a prominent shikara or vimana (dome/tower over the womb chamber that contains an image of the god to whom temple is dedicated). The shikara represents a type of mountain ascent toward heaven. The shape of the shikara varies from region to region, organic to geometric. Many temples like this were covered in row upon row of figural sculpture much in the same vital, elegant style as the Siva Nataraja. c. 476 ce End of the western half of the Roman Empire. Western parts seized by numerous nomadic peoples who ultimately assimilated Roman aesthetics in their art. c. 1000–1150; and 1150–1400 Romanesque and Gothic periods in Western Europe, a time of great church building in stone using elements learned from Roman architecture, flourishing of manuscript illumination, metalwork, and stone sculpture. c. 960–1279 The Song Dynasty, a long period of flourishing in all the arts. Particularly revered by later painters as the period when landscape painters established aesthetics that have lasted into the 21st century. c. 1000–1300 Second wave of migration of Polynesians to Society Islands and Hawaii. Hawaiian rulers undertook large-scale environmental programs such as fish ponds, terraces, irrigation systems, and temples. c. 900–1250 Late Classic period in Mexico, a time when the Toltec culture took over, inhabiting and refurbishing some Mayan cities such as Chichén Itzá. c. 600–1000 Tiwanaku culture flourished in Bolivia, most noted for architecture, textile, and ceramic arts.